Pure Chronos iDock Series II review | What Hi-Fi? The second iteration of Pure's radio/alarm/iPod dock takes the all-round abilities of the five-star Series I from a couple of years ago and improves on them. 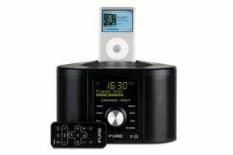 For your £100, you get a stereo DAB/DAB+/FM clock radio with an iPod and iPhone dock that will play and charge pretty much any iPod you can throw at it, bar the Shuffle. There is also an auxiliary input for other MP3 players and sources. The fascia is dominated by a large control knob, which takes much of the effort out of setting things up just how you like them – the flat buttons on the Series I were far less intuitive to use. The display is nice and clear, and will show the track that is playing on your iPod, as well as the usual DAB niceties. A more appealing face is all very well, but it's with the improvement in sound over its forebear that the Series II really impresses. Whatever the source, the sound coming from the side-mounted speakers is fuller, richer and clearer than before. It's a larger, more impressive sound than you might expect from such a relatively small box. Take those improvements and marry them to an effective four-alarm system that you can set to go off each weekday, at weekends, or once only, and wake you up with radio, a tone or your iPod, and you've got a great, and truly useful, product.